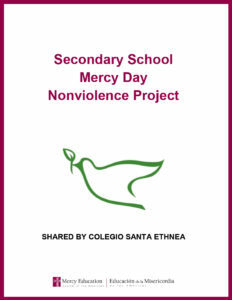 The curriculum and projects below focus on the Mercy Critical Concern for nonviolence. We are grateful to the educators at Colegio Santa Ethnea in Bella Vista, Argentina, for sharing these resources. 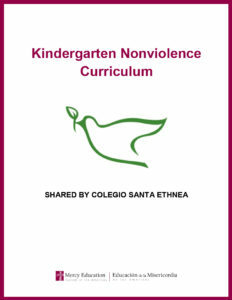 This guide includes curriculum ideas for natural and social environments, literature, visual education, personal and social formation / emotional education / integrated sexual education, practices of the use of language and physical expression. 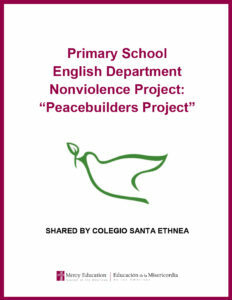 This project helps students in grades 1-6 learn about building peace with everyday actions; learn and reflect on the lives of different peacebuilders including Catherine McAuley, Malala Yousafzai, Mahatma Ghandi and others; and share the message of peace with the rest of the school through visual displays. Accompanied by faculty members, students visit local families to talk about peace, share a blessing and leave a gift of holy water. Each family is also invited to come to the school later for a student performance. The full project is described in this letter to faculty from Ali Botto, coordinator of catechesis, and can be adapted to meet the needs and locality of your school.